In the previous post, we looked at how to support fine-grained access control of tables using Oracle VPD technology. In this post, we are going to have a quick look at another technology with similar purpose called OLS (Oracle Label Security) which is built on top of VPD. A commonly raised question is that if both VPD and OLS serve the same purpose, why do we need OLS? While VPD is a generic solution, OLS addresses a very specific and common use case in many government and corporate environment - allow access to data based on the need to know basis. Unlike VPD which requires administrator to write PL/SQL code for the policy function, OLS requires no programming. You can think of OLS as a out-of-the-box VPD with built-in policies. What exact does OLS address? Many government and business organizations, label their data using different sensitivity levels, such as top secret (TS), secret (S), confidential (C), unclassified (UC), depending on the perceived risk levels so that they can selectively protect most valuable assets of the organization. Users are assigned different clearance levels based on their job functions and seniority. Each user is allowed to access only those data records with the sensitivity level no more than the clearance level of the user. For example, if user tom is assigned the clearance level C, he can access data records with the sensitive levels C or UC only. He is not allowed to access data records with sensitivity levels greater than C, that is, TS or S.
The following diagram shows the example that we will walk through later in this post. 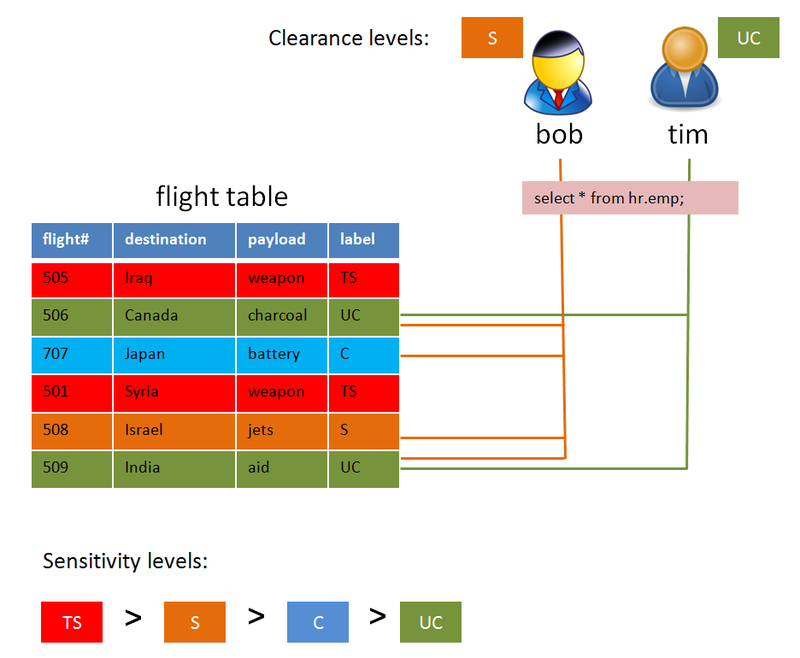 The table flight has data of different sensitivity level and based users' clearance levels they see different set of records even though they issue the same query. Row level access control is enforced transparent to end users. How are row sensitivity labels assigned? How are user clearance levels decided? If it is a database user, SA_USER_ADMIN.SET_LEVELS procedure assigns a default level to each user. At the time of login user will have this clearance level. In a session, user can change the clearance level to a level less than the maximum level granted using SA_SESSION.SET_LABEL procedure. If it is an application user who does not have a database user, SA_SESSION.SET_ACCESS_PROFILE procedure allows to set an existing database user's profile to be the profile of the application user. 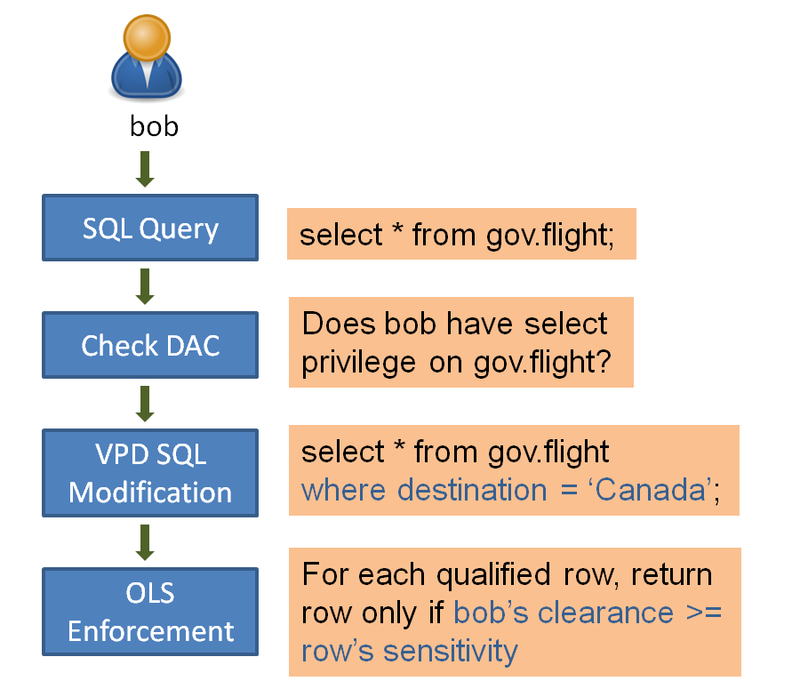 SQL> -- when bob is inserting new records to gov.flight. With the quick understanding of the OLS technology, I encourage you to look the Oracle documentation to learn more about OLS and its new powerful features. Thank you very much for simplifying things for the public. Keep Posting more!! God Bless!! Nice one. There might be a slight catch, we must configure and enable Oracle label security before execute the procedures.